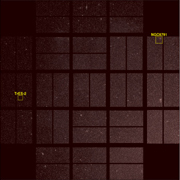 This image from NASA's Kepler mission shows the telescope's full field of view — an expansive star-rich patch of sky in the constellations Cygnus and Lyra stretching across 100 square degrees, or the equivalent of two side-by-side dips of the Big Dipper. Kepler was designed to hunt for planets like Earth. Of the approximately 4.5 million stars in the region pictured here, more than 100,000 were selected as candidates for Kepler's search. The mission will spend the next three-and-a-half years staring at these target stars, looking for periodic dips in brightness. Such dips occur when planets cross in front of their stars from our point of view in the galaxy, partially blocking the starlight. The area in the lower right of the image is brighter because it is closer to the plane of our galaxy and is jam-packed with stars. The area in upper left is farther from the galactic plane and contains fewer stars. The image has been color-coded so that brighter stars appear white, and fainter stars, red. It is a 60-second exposure, taken on April 8, 2009, one day after the spacecraft's dust cover was jettisoned. 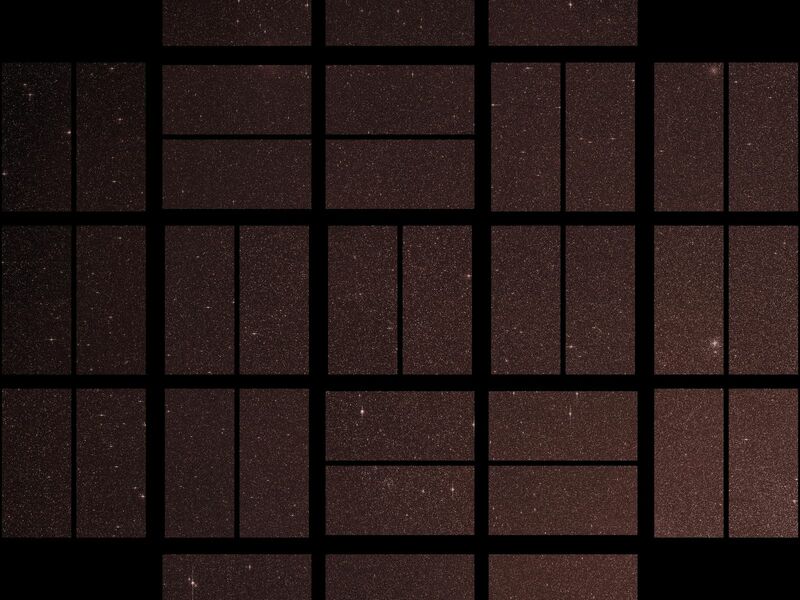 To achieve the level of precision needed to spot planets as small as Earth, Kepler's images are intentionally blurred slightly. This minimizes the number of saturated stars. Saturation, or "blooming," occurs when the brightest stars overload the individual pixels in the detectors, causing the signal to spill out into nearby pixels. These spills can be seen in the image as fine white lines extending above and below some of the brightest stars. 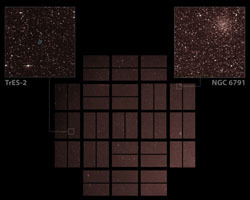 Blooming is an expected side effect of Kepler's ultra-sensitive camera. Some of the lightly saturated stars are candidates for planet searches, while those that are heavily saturated are not. 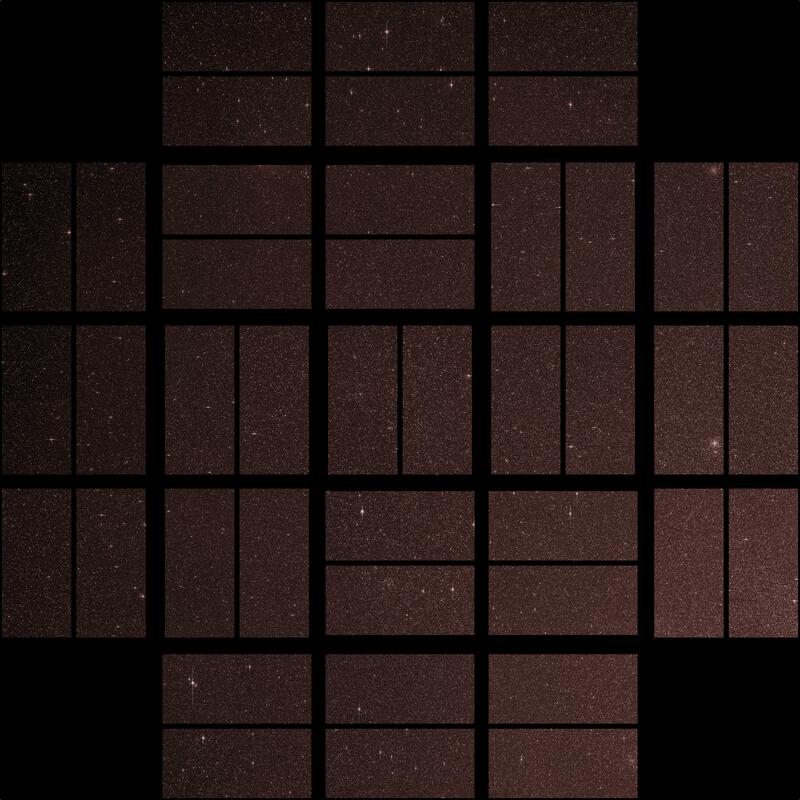 The grid lines across the picture show how the focal plane is laid out on Kepler's camera —the largest ever launched in space at 95 megapixels. There are 42 charge-coupled devices (CCDs), paired into square-shaped modules, whose outline can be seen in the image. A thin black line in each module shows adjacent pairs of CCDs. 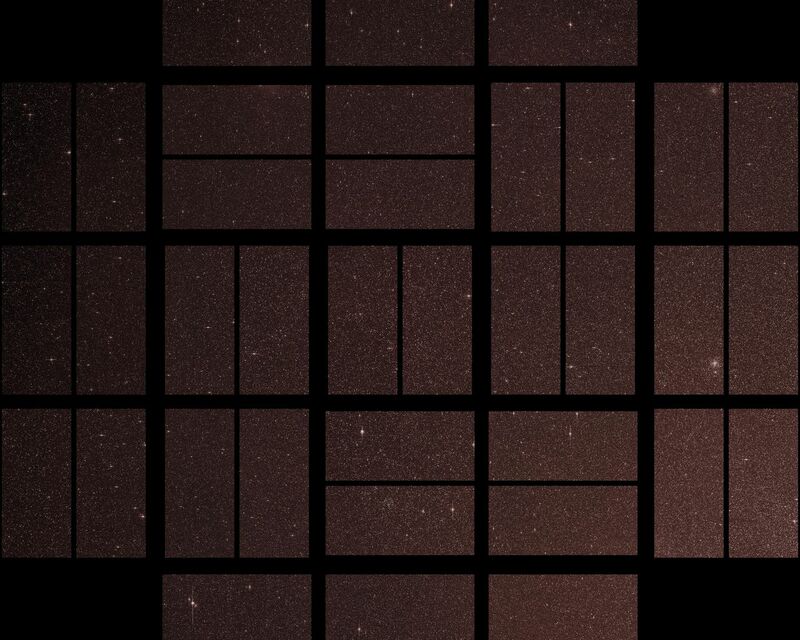 The thicker black lines that cross through the image are from structures holding the modules together, and were purposely oriented to block out the very brightest stars in Kepler's field of view. The four black corners of the image show where the fine-guidance sensors reside on the focal plane. These sensors are used to hold the telescope's gaze steady by measuring its position on the sky 10 times every second, and by feeding this information to the spacecraft's attitude control system. Ghost images also appear in the image, which are reflections off the lenses above the CCDs. 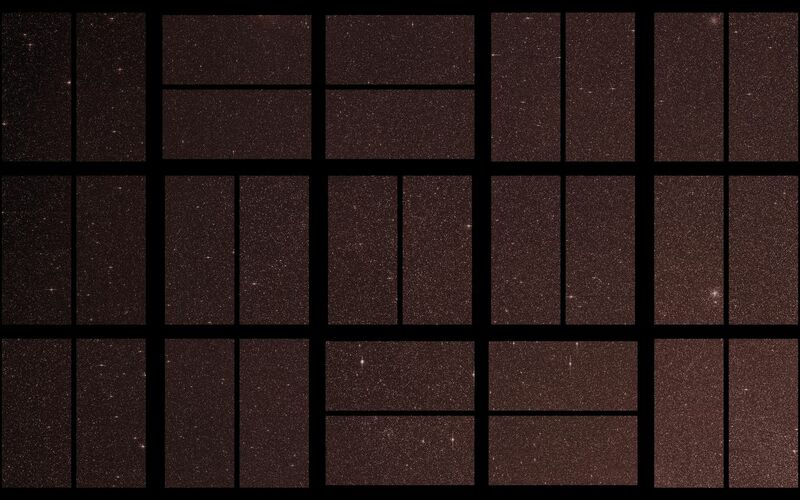 These expected artifacts were mapped out during ground testing for Kepler, and will not affect science observations because they will be removed as the data are processed.